1. Thickly slice the tomatoes and place them randomly on a flat platter. Sprinkle with the salt, pepper and sugar, then cover and leave to marinate at room temperature for 20-30 minutes. 2. Meanwhile, mix the olive oil with the finely grated zest of the lemon and 1 tablespoon of its juice. Roughly chop the oregano and parsley, and add them to the dressing with the garlic. The tomatoes are already well seasoned, so you shouldn’t need to add any further salt and pepper to the dressing. 3. 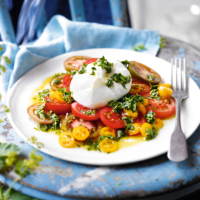 Drain the burrata and place into the centre of the tomatoes. Cut a deep cross in the top of the cheese with a sharp knife and pinch the sides with thumbs and forefingers to open it up. Drizzle the dressing over the salad, then serve immediately with the crusty bread.